If your child is into comic strips and loves Snoopy and other Peanuts characters, then throwing a Snoopy birthday party is a great move! Create a terrific party atmosphere, prepare food, and plan your activities using ideas from this page. Use images of various Peanuts characters when making Snoopy party invitations. You can paste a picture of Snoopy with Woodstock on the front of the invitation cards, or a group image of the entire Peanuts gang. To be even more original, you can enlarge the comic strip on your computer. Then print it on cardstock paper. Next, fold the paper in half so the comic strip image remains on the outer side of the “cards.” Write your Snoopy birthday party details on the inside. Finally, you can make your invitations in a shape of Snoopy’s doghouse. Create a doghouse template using sturdy paper. Fold red construction paper in half. Place the template next to the fold, outline and cut out the shape without cutting the fold. Add black lines on the front and back of the “house” so it looks as if it’s made out of wood. Write party information and stick Snoopy theme stickers on the inside. Enlarge an image of Snoopy and tape it to the fence. Tie balloons in bunches to the gate and mailbox. Have your child draw dog paw prints on the walkway with chalk. Get Paint-a-Doghouse activity kit , and place it in the middle of the room. The kids can paint it red as one of the party activities. Or, if you wish, you can create a dog house yourself using 2 or 3 large cardboard boxes. Then staple red construction paper all over. Enlarge Peanuts comic strips and tape them to the wall. Spread out paper streamers all around the area. Create theme standees by enlarging Peanuts character images and gluing them to sturdy pieces of cardboard. Buy dog bowls from a dollar store, and place them at each setting on the party table. Serve food in those bowls. Create theme placemats by enlarging and laminating images of Snoopy. Hang “Happy Birthday” banner nearby. Tie balloons to the backs of the chairs. *Guess How Many: Fill a glass jar with peppermint patties. When your guests enter the door, get them to guess how many patties are in the jar. The person who guesses the closest to the amount — wins the jar with patties. *Create a Comic Strip: Tape butcher paper on the wall. Get the kids to work as a group to create their own Peanut character comic strip. Help them out as much as you can. Add speech bubbles for dialog among characters. *Color the Page: Search for and print Snoopy coloring pages off the internet. Spread them on a coffee table. Provide crayons and markers, and have young kids color them as they wait for arriving guests. For Snoopy birthday party favors, have such items as dog collars and ears, comic books, crayons, yo-yos, bracelets, Snoopy stickers and band-aids. *Find the Bone: Cut dog bone shapes out of cardboard (or other sturdy paper). Get your child to decorate them with markers. Hide them all around the party scene. When all the guests have arrived, get them to find as many “dog bones” as they can. Help out the younger children with clues. *Snoopy Bean Bag Toss: Have the children toss bean bags into a large dog bowl from a distance for points. At game time, divide the group into 2 equal teams. Create 2 newspaper piles on the opposite side of the area. On the command go, the first players on each team must race to the other side of the room on all fours, pick 1 newspaper with their mouth, and return back to the finish line as fast as they can. The race continues in this fashion with all the players on each team repeating the process. The team to retrieve all the newspaper to the finish line first, wins! *Snoopy Says: At Snoopy theme party, Simon Says turns into Snoopy Says game. *Best Bark Contest: This party game works great for younger group of kids. One at a time, invite the guests to come up with their best bark. Award prizes for the scariest, most real, funniest, silliest…etc. bark. Make sure that everyone receives a prize. *Pin the Nose on Snoopy: Get a poster of Snoopy and tape it on the wall. Cut nose shapes out of black construction paper for all the participants. Write guests’ initials and put a double-sided tape on each piece. One by one, blindfold the kids, spin around and get them to tape the nose on Snoopy where it belongs. The person who places it the closest — wins! *Charlie, Charlie, Snoopy: Play a theme version of Duck, Duck, Goose game. 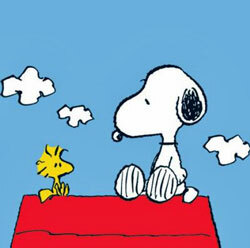 *Watch the Show: At the end of the party, invite the children to watch an episode from one of the animated Snoopy films. *Snoopy Cake: Bake a rectangular cake. Find an image of Snoopy on the internet and print it up. Use the picture as a guide to outline an image of Snoopy on the cake with a toothpick. Then frost the cake in appropriate colors. *Dogs in a Blanket: For this recipe, you’ll need hot dogs, refrigerator croissants and cheese. Cut hot dogs lengthwise about halfway through and cut cheese into strips. Unroll croissants into separate triangles and stuff them with hot dogs and cheese. Roll croissants back up and bake on cookie sheet at 375ºF for 10-12 minutes, or until golden brown. *Gelatin Bones: Prepare Jell-O following package directions. Make bone shapes using bone shaped cookie cutters. *Dog-wiches: Prepare sandwiches and cut them into bone shapes. *Snoopy’s Favorite Snacks: Fill dog bowls with pretzels, nuts, cereal, dried fruit, and so on. Kids can munch on these delicious snacks in between the activities. *Dog Biscuits: Prepare cookies that look like dog biscuits. *Satisfying Slurping Punch: Purchase 10-oz packages of frozen berries (such as blueberries or strawberries). Partially thaw the frozen berries and puree in blender. Next, mix the contents with frozen lime juice concentrate from a 12-oz can. Chill for about 1-2 hours. Pour the mixture into a punchbowl. Add 32-oz of ginger ale, 32-oz of club soda and scoops of 1 pint of vanilla ice cream.